My morning always seem to fly by quickly and I don’t notice it’s lunchtime until my stomach is growling something fierce. And I’m not going to lie – sometimes chips and salsa sound like a perfectly acceptable quick lunch. But I also know that if I want to avoid an afternoon slump, I need to eat a healthy, filling lunch to keep me going. 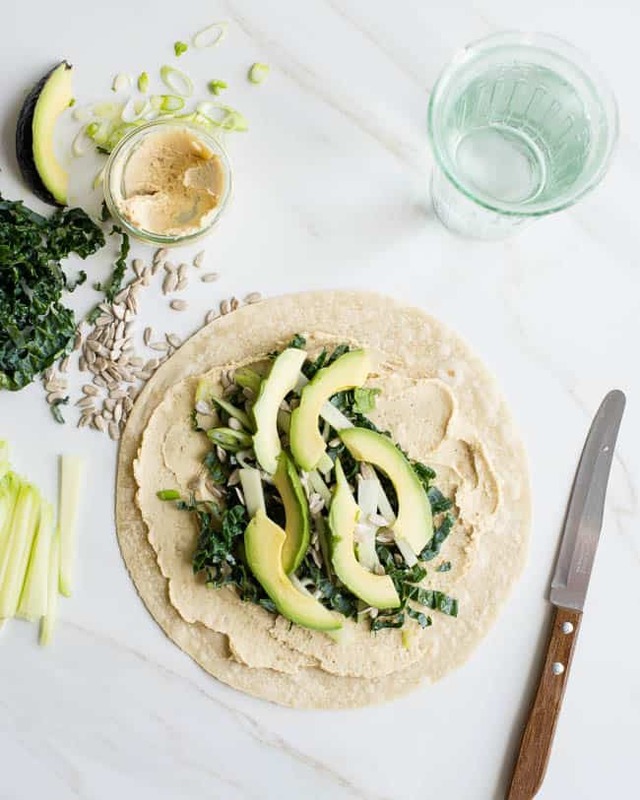 Enter the Protein-Packed Kale and Hummus Wrap. It’s easy to make and I can even put a few together in advance so I have lunch for several days already planned out. It’s also easy to swap out different veggies and greens. You could also add cheese if you wanted to. The hummus, kale, sunflower seeds and avocado provide protein and good fats to keep your body satiated. If you’re grain-free, you could totally make this using lettuce leaves or collards. To make it ahead, keep it wrapped well with plastic wrap to keep it from drying out. Toss the avocados with a little lemon juice to keep them from turning dark brown. (They will turn a little brown, but they’re safe to eat.) Store in the fridge until you’re ready to eat. 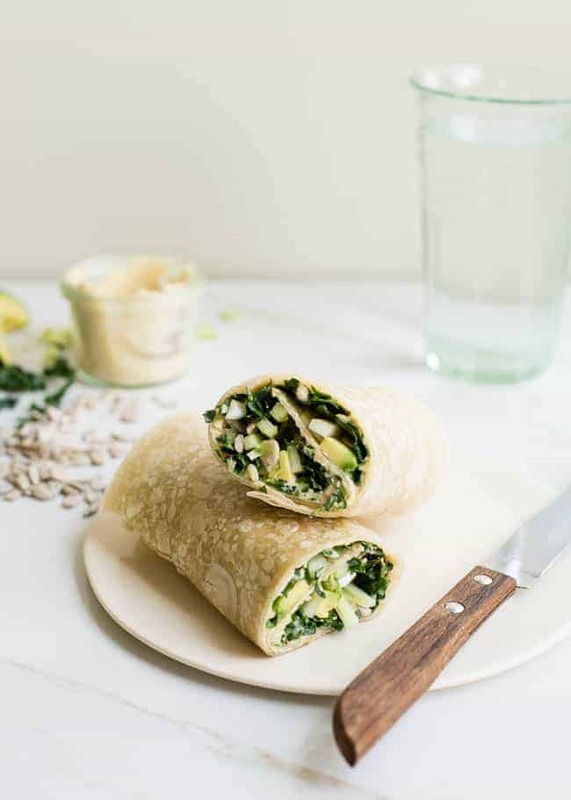 Give your afternoon a boost with this yummy, protein-packed wrap made with hummus, kale, avocado, cucumber, green onions, and sunflower seeds. Lay the tortilla on a clean flat surface. Spread the hummus over the tortilla in a thin, even layer. Top with the remaining ingredients, leaving extra space on the sides. Start with one edge and roll the tortilla up. Cut in half and eat. You say “protein packed”, but I don’t see any substantial protein in this meal? It looks like this meal would only net you 6 grams of protein, which is only 13% of your daily value. All of the elements contain protein. True, it doesn’t have as much as say, a hamburger, but if you want more protein you could use more hummus and add more sunflower seeds and kale. This is just the type of food that will help you stay on a weight loss regimen such as what I’m doing now: “good” fat that we all need, whole grains and veggies – this is a perfect meal. Not to mention delicious! I might add a few drops of sunflower oil just because I like it. Such a healthy and tasty looking wrap!! Looks so good! I’ve been craving some good avocado recipes… and I’ve always become a fan of wraps so this is just the bomb diggity!